The M-308 4-16x42 represents Nikon’s Precision AR Optic technology for heavier caliber rifles capable of long-range accuracy. 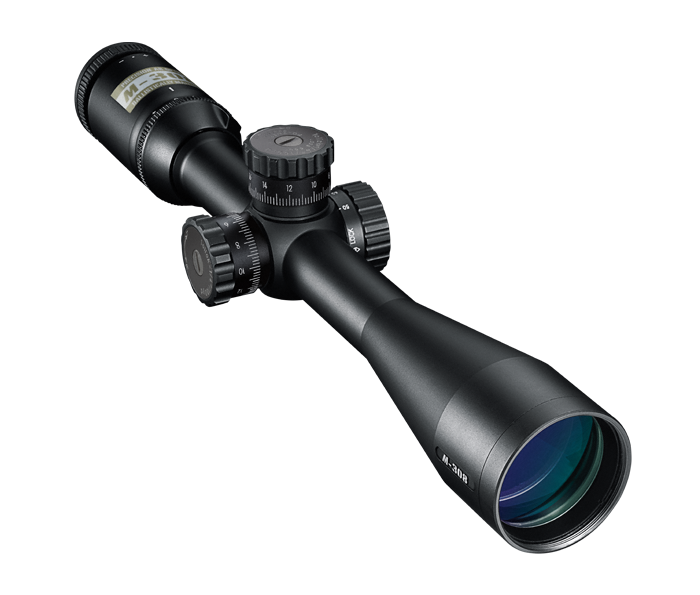 A large magnification range combined with an oversize lens provides accurate shots with heavy caliber rifles in any conditions. Developed specifically for the trajectory of the .308 Win/7.62 NATO Match round with 168gr. HPBT match bullet. The BDC 800 reticle is designed for a 100 yard zero on the crosshair - with points representing all ranges from 200 to 800 yards. To simplify field adjustments, the M-308 utilizes Spring-Loaded Instant Zero-Reset Turrets. Just sight-in as usual, then lift the spring-loaded adjustment knob, rotate to your “zero”, and reengage. Field adjustments are now as simple as dialing-in your subsequent ranges. Nikon has engineered the entire optical system of the M-308 to provide the shooter with a bright, sharp, incredibly flat sight picture and light transmission up to its theoretical maximum—95%, allowing for a clear sight picture from dawn to dusk.